I wish I knew more about my uncle Joey. The memory bits I have of him are organized willy-nilly in my mind like a kitchen junk drawer that has all sorts of little interesting things, but is never quite as organized as you want it to be. The bits are like shards of picture that I'm trying to assemble to catch a glimpse of him. Selfishly, as family memories go, perhaps I'm trying to assemble the shards to get a glimpse of myself. At any rate, among the bits is the memory of my uncle's obsession with earlobes. My uncle Joey's was obsessed with touching earlobes, at least that's how I remember it. He would call you over, and he would talk to you in a low, authoritative voice, and fondle your ear. He died at 50. I just turned 50 and it recently occurred to me that his obsession with earlobes was a bit odd. I suppose I let him do it for many reasons. He was a father figure and you didn't argue, and I was in need of that kind of attention. He was one of my 4 uncles that I wanted to know better. The attention and ear touching was the only 1-1 time we had together. As a kid, we rarely went to Joey's house, but when we did, it was treat. His house projected an aesthetic that enticed me. The living areas were like exploring a small museum displaying objects out of a cabinet of curiosities of a Renaissance collector. He had art, a real leather couch, and a cool stereo. The kitchen area in his house was slightly chaotic and well-used: a loaf of bread and butter out on the counter, and crumbs. My mother, Joey's sister, kept a different house. We had living areas filled with ordinary stuff: a penny jar, empty chianti fiaschi, posters, and a fabric couch. Our kitchen looked like it was rarely used, everything neatly put away, not a crumb or anything to be found on the counters. Joey built his house by hand, at least in my mind. It was part lodge, part tree-house, constructed in natural woods with an open floor plan, and views to the surrounding countryside. By contrast, our pre-fab house arrived on a tractor trailer in two halves that were snapped together creating a rabbit warren of small rooms with flimsy walls. We looked out on our neighbors in a suburban track development. We had puke-colored carpet that scratched our skin during wrestling matches. No natural hardwood floors for us. 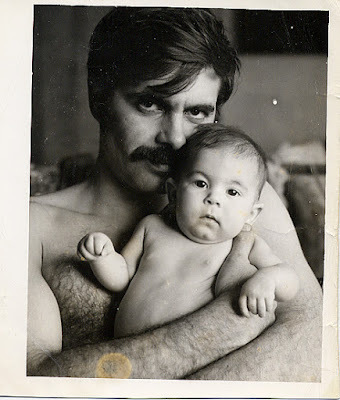 I remember my uncle Joey projecting manliness and outdoor ruggedness with a touch of sophistication that seemed lacking in other people in my life. His skills seemed practical. With his forestry degree, he could identify trees and tell stories about them. What could be cooler than that? Boy did he knew how to grow trees - lots of them. It seemed that people paid him well for that skill. My dad delivered fuel oil, ancient trees in liquid form. A case of the trees looking greener on the other side of the fence? Maybe so. I was always secretly envious of my two cousins, Joey's daughters. I wanted to be part of their family. Though, I’m guessing my cousins' image and experience of their dad is likely a tad different than mine. Heck, Joey even had a waterbed and once, with my two cousins, we sneaked up and bounced around on it. Now that's living I thought. I admit the line between fact and myth is a bit blurred in regard to my uncle Joey, but I kind of like it that way. I imagine him working for days in the forest, able to survive on wit. He seemed to know something about everything, and I was ever so curious. Yes, you can fondle my earlobe if you tell me a story about a tree. While my siblings and I spent a lot of time with my mother's family, my uncles were like distant satellites checking in periodically in their orbit around my grandmother. My grandmother was sort of gravitational force that once in her pull, it was hard to escape. One of my other uncles called my grandmother the "planet". Figuring large into the physics my family was the tumultuous relationship between my mother and her mother, and the constant tension in the air between my mother and her brothers - at least perceived by this 10 year old kid. This was a solar system that had problems. One uncle seemed to always be strung out and didn't want anything to do with pesky nephews and nieces. Another uncle lived far away, drove a VW bug, was viciously smart and cruel. We'd see him occasionally and that was enough. A third uncle was dark and handsome, but prone to bouts of anger. I remember him jumping up and down on a car roof and brandishing a gun. That left my uncle Joey, the oldest of the brothers and seemingly most sane. So what if that came with a little ear fondling. My uncle Joey once gave me the book Broca's Brain: Reflections on the Romance of Science, the 1979 book by astrophysicist Carl Sagan. I was about 15 at the time, and I remember the book being an invitation to enter into Joey's world. A book I ought to read. A book that Joey thought was important. The book's black cover and somber red title font conveyed seriousness. I didn't read it, at least not right away. It wasn't until many years later that I made it through Broca's Brain, sorry for the lost opportunity to have discussed it with Joey during one of his ear fondling sessions. If I had to give one image to fix in your mind the image of my uncle Joey, Carl Sagan would in fact be it. Joey, 10 years younger than Sagan, I imagine followed Sagan as a role model, in scientific leaning as well as in fashion. Joey's thick dark hair was always swept to one side, not too fussy much like Sagan's. As well, my uncle was prone to wearing a tan corduroy jacket, with elbow patches, and a simple turtle neck sweater underneath. I suppose the seventies were partly to blame. Joey even spoke like Carl Sagan with a slow deliberate cadence. He gazed at you as if sizing you up, formulating the right question to catch you off balance. He wasn't the kind of uncle to ask you a quick math problem. No, it was a more serious question that made you think deeper. Something about stars and infinity, like Sagan would ask. Joey attended Paul Smith's college in the Adirondacks where he studied forestry, and taught at the University of Connecticut. He was by all means the most successful in the family, if not the most revered. He was a Sagan in training. A few years after he gave me Broca's Brain, I left home and the unstable solar system, and slowly lost contact with my uncle and his life during the 1980s and early 1990s. I don't understand the details of what happened, but it's fair to say that his life got derailed: a divorce, drugs, and untimely death. All I have left of Joey are a few photos and vague stories about the photos. 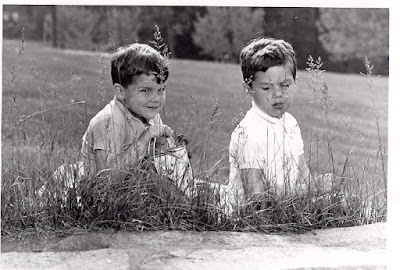 First, there's the black and white photo of me and my brother sitting in the grass. We are about 4 and 6 years old. 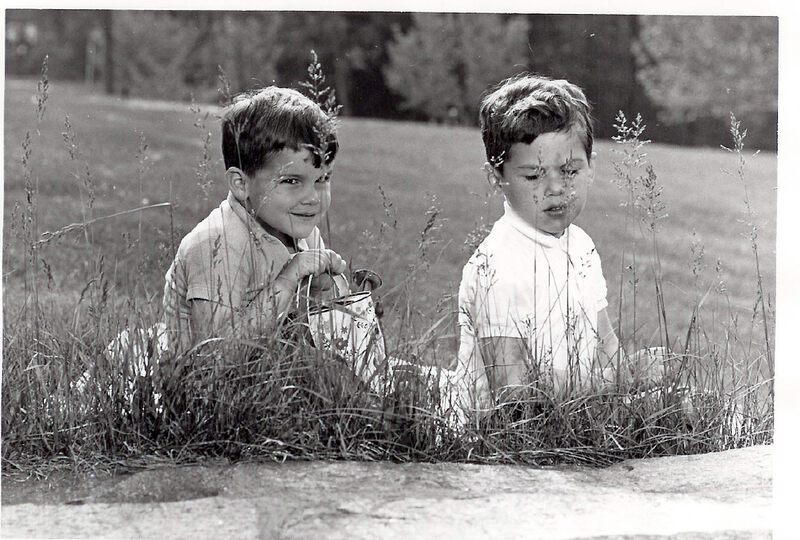 I stare mischievously at Joey behind the camera, while my brother gazes bored at the ground. The photo transports me back to my grandmother's yard long the Farmington Valley River in Connecticut. It was our playground when we were young. If we were lucky, my uncle Joey would be there and with camera. My grandmother's tiny dining room was the stage for countless family events. The room had two windows, a closet, a desk, a hutch filled with nick-knacks, and two doorways took up most of the wall space in the room. What little wall space remained was taken up by examples of my grandmother's needlepoint and a photograph of Michelangelo's David taken by Joey. In the photo, David is photographed from the side and superimposed on a photo of a galaxy. A master of the photography and photo-processing, the image is an example of the blend of art and science that Joey embodied. My grandmother wasn't one for putting up much art, so this photo was important to her. If only that photo could talk and relate the what it saw over all those years. I have very few photos of Joey himself. He worked the other side of the camera mostly. Of the photos I do have, two stand out. The first is a 1975 black and white snapshot. Joey is bare-chested and holding my recently-born cousin. Both gaze out of the photo as if in a stare-down match with the viewer. The second photo, is one of the last taken of him in 1993, a year before his death. A very gaunt, shell of the man from the first picture stands by the same cousin, now fully grown and recently-graduated. Joey stands behind my cousin and my grandparents encircling them with outstretched arms as if swooping in behind them. Protecting or holding on, I can't decide. An impossibly bright bank of yellow school lockers dominates the photo. There is tension in everyone's faces. I remember the call from my mother: "Joey is dead. He froze to death." On a cold January day in 1994 he wandered into a roofless building that was under construction in the prosaic village of Pine Meadow, got locked in, and was found the next day. Some say maybe he went to the liquor store nearby, got drunk, and became trapped. Some say he knew he was dying and went there knowing the consequences. Others say it was an accident and he was too weak to get out. Whatever the explanation, he died in nature, which seemed strangely fitting. It was a cold, mysterious, and unfinished ending for me, much like my relationship with him. Our relationship froze at the point of the young boy who had a minute or two with an enigmatic ear fondler. What are earlobes for? It seems the jury is out. Various suggestions include helping collect sound for the ears, acting as an erogenous zone, making us more attractive to partners, or just plain having lost their major biological function being vestiges of an earlier function. More ambiguity to live with, just like Joey's passion for the Lobulus auriculae, as earlobes are called in Latin and which I'm sure Joey would have known. Many of my memories of Joey capture some aspect of truth, but never quite reveal him fully. But where there isn’t fact, fantasy fills in nicely. I’ll have to live with the ambiguity. I don't know what the purpose of an earlobe is let alone why my uncle liked to fondle them. So be it. Carl Sagan died two years later in 1996. As Sagan said in his iconic Cosmos series: "The cosmos is within us. We are made of star-stuff. We are a way for the universe to know itself." Both Sagan and my uncle are now part of that star-stuff. I hope the universe can figure out the ear thing. Wow. I can't believe I never read this. You should share this with our cousins. I'm certain they'd appreciate it. Such a visual feast for a nostalgic journey. Thanks!